There is, I suppose, a kind of holy grail when it comes to color analyzers used for measuring the performance of video and film sources. The perfect device would offer reference grade color accuracy, good low-light sensitivity, speed, ease-of-use, and manage of of this while keeping the device relatively affordable. No one device does it all. Spectroradiometers from a variety of manufacturers offer reference grade color accuracy, but they can also be very slow with poor low-light sensitivity, and often cost as much as a new car. Filter-based colorimeters are generally more affordable. They also offer good speed and low-light sensitivity. However, their color accuracy really cannot compete with a 5nm spectro. No device is perfect. However, in my judgment the Klein K-10 colorimeter comes about as close to the ideal that we have been seeking as any instrument that I am aware of. It offers near reference grade colorimetry along with lightning fast speed, world-class low-light sensitivity, and exceptional usability. The MSRP is $7,000. Granted, this is not a budget device, and probably only pros will be willing to spend this much for a color analyzer. However, it is important to keep this in perspective. Even at full MSRP, this is less than half the cost of a 5nm PR-655, and only slightly more than half the cost of a Minolta CS-200 colorimeter. The K-10 is the top of the line in Klein's catalog of colorimeters. It is light weight and approximately 10-inches in length and 2 1/4 inches in diameter. It connects to a PC via a serial cable, which ships with an attached USB adaptor. The instrument draws its power from the USB connection so no external power source is needed. It also ships with a diffuser for illuminance readings, a rubber read head boot that will fit snugly against a display for direct contact readings, and a black metal extension tube. The read head boot ensures optimal distance from the display source and offers the added benefit of shutting out external light sources. This offers calibrators the flexibility of taking accurate readings in environments that do not have good light control. This is not a trivial matter. I tested a 75% color patch on a plasma in a dark room and in a fully lit room. In the fully lit room, the color patch was measurably desaturated. However, with the read head boot flush against the screen, the readings were identical to those obtained in a fully dark room. Furthermore, the boot is not adhesive, nor does it place a significant amount of pressure on the screen, so there is no danger of damaging delicate LCD screens. All of this is packaged in a very nice brushed aluminum case. The fit and finish of the colorimeter and the accessories scream quality and are rugged enough for regular field use. The K-10 will generally be mounted on a tripod. A small metal tripod—apparently designed for use in a laboratory environment—ships with the product. The software that comes with the unit is quite basic, but displays xyY data and plots readings on a CIE chromaticity chart. Despite the physical USB connection, it is a serial device so users must select a serial port prior to use. The unit also includes 8 LEDs that serve to define the reading area, but these devices have very low light output and are of marginal value. They will not, for example, paint a circle on a display from a distance, which calibrators could use as an effective aiming device. Using the K-10 is simple. I had the software installed and ready to use within five minutes. All the user has to do is select the correct port on the PC, load the desired calibration files (the Klein ships with files for LCD, CRT, and DLP in illuminance mode), and then simply click the Measure Color button. The K-10 automatically enters continuous mode while reporting a string of results until the user clicks Hold. Oddly, the only readings the Klein software takes are in the continuous mode. It is not currently designed to take single readings at all. The reported results are returned instantaneously and are extremely consistent. For those accustomed to seeing readings bounce around, this is a welcome experience. 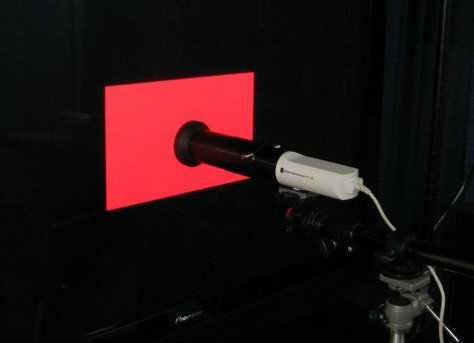 Most users interested in video calibration will probably want to use the Klein with software optimized for that purpose. ChromaPure Professional supports the Klein. The K-10 appears to be designed for use primarily as a contact device. However, I also used it to take readings directly from a front projector's screen with good results. This is one application where the lack of a true aiming device was missed. In practice you can place the K-10 close enough to the screen that aiming is not an issue, but I would not attempt to use it to take readings from near the seating position as I am accustomed to doing with other non-contact devices. I did not test it with the diffuser in its illuminance mode. SMPTE guidelines specify that readings should be taken directly from the screen, and direct lens readings would have to be corrected with an offset in any case. In any event, the K-10's phenomenal low-light sensitivity makes a direct lens reading unnecessary in the vast majority of cases. I have already commented on the K-10's speed. It low-light sensitivity seemed equal to, or actually exceeding, my reference Minolta LS-100. I was able to get consistent black level readings from a Pioneer Kuro plasma that agreed with the Minolta to within 0.001 cd/m2. I didn't have any other display with a lower black level to test it on, so the full extent of its ability to measure low light sources remains unexplored. For most calibrators, though, color accuracy is the decisive factor for any meter. It does not matter how fast or how low a device reads if the color accuracy or repeatability exceeded acceptable tolerances. I tested the K-10 on a Sony CRT, a Sharp DLP front projector, a ViewSonic LCD, and a Pioneer plasma. After each run I immediately took measurements from the Jeti spectroradiometer and then compared the results. I was satisfied that the Klein's luminance readings were reference grade, so I compared the chromaticity values only. See the table below for details. For a filter-based device, this is exemplary performance. There were occasional bumps in accuracy, but the average error with four different displays never exceeded xy0.006 or CIE94 1.2 for color or xy0.006 CIE94 2.9 for white. These results are somewhat better than what I see with the X-Rite i1Pro spectrophotometer and the i1 Display Pro colorimeter, the only two sub-$1000 color analyzers I would consider even minimally acceptable for professional work. Of course, the Klein costs many times what these devices cost, so the small increase in colorimetric accuracy and the rather substantial increase in usability make the K-10 suitable only for those who are willing to pay a lot more for that extra nth-level of accuracy. The only other sub-$10,000 devices that I know of that could improve on the K-10's color performance are the Jeti spectroradiometers, and these devices cannot come anywhere near the K-10's speed or low-light sensitivity. Perhaps a better comparison would be the X-Rite Hubble*, which offers a similar design to the K-10 at a somewhat lower price. The Hubble is also very fast and consistent and it provides excellent low-light performance as well. One other appealing aspect of the Hubble is that—unlike the K-10—it provides an effective aiming system for distance measurements. However, the Hubble's color accuracy falls short of the K-10 and the Hubble requires regular dark level readings to maintain its accuracy. The K-10, like the i1 Display Pro, requires no dark reading at all. For myself, requiring the user to perform periodic dark readings is close to a deal-breaker. The amount of extra effort this adds to a long calibration is not trivial, and perhaps explains why I never really warmed up to the i1Pro, despite its many obvious virtues. As you can probably tell I am a big fan of the Klein K-10. It is not perfect. It cannot, by design, offer true reference level color accuracy, though it comes tantalizingly close. It also needs an effective aiming system before it will seem entirely at home in the home theater calibration market. I could pick some nits as well. I would prefer a longer cable for placement flexibility (the Hubble's cable is much longer) and/or a cable that detaches at the meter end, rather than being hard-wired onto the device. Try screwing an instrument with a cable attached onto a tripod without getting tangled up and frustrated and you'll know what I mean. No other sub-$10,000 instrument I have tested offers the mix of accuracy, speed, low-light sensitivity, ease-of-use, and high build quality of the Klein K-10. I have added the K-10 to my inventory of essential calibration tools for regular use in the field. They have increased the power to the internal LED lights. This provides an aiming mechanism to the unit, which was sorely needed. They have swapped out the light-sensitive photo diodes for larger, more sensitive, units. This results in a claimed 3x increase in sensitivity. Existing K-10s can be retrofitted to include these new features at the factory for $500. Contact Klein for details. I have now had a chance to spend some time with the upgraded unit and have formed some impressions. First, with respect to the aiming mechanism, it is a important improvement over the previous implementation. Previously, the aiming LEDs were of such low intensity that they were of limited value. The more powerful LEDs are now bright enough to paint an image on the display surface that can be used to aim the colorimeter. The only limitation is that they are still not as bright as the laser aiming systems found in some other high-end color analyzers. The consequence of this is that you should use an aiming test pattern of limited luminance, otherwise the image produced by the aiming lights will not be visible against the bright test pattern. I found that just about any aiming pattern on a projector screen was adequate, which is where this device will be the most useful. However, aiming the colorimeter at a flat panel display is more challenging, because flat panels are much brighter than projection screens. Thus, for non-contact flat panel aiming you must use a very low intensity test pattern to ensure that the light from the K-10's internal aiming LED lights are visible on the screen. Second, the increased sensitivity of the new diodes had an unexpected, but welcome, utility. This upgrade has no effect on color accuracy. Even a low-priced colorimeter can be calibrated to read extremely accurately if it is properly calibrated to the target display with a reference spectroradiometer. The update also had little effect on speed. The K-10 was already the fastest color analyzer in the business, so there was little improvement in this regard to be had. However, a substantial improvement was achieved with low-light repeatability. Some colorimeters will struggle with good repeatability when taking very low-light measurements from some displays, plasmas in particular. However, the improved K-10 is absolutely rock solid all the way down to 5% stimulus on a plasma. The reason that repeatability at low light levels can be a problem is that as the signal strength from low-light sources decreases, at some point the low signal strength will be substantially affected by the internal noise of the instrument. The purpose of dark readings that many instruments use is to filter out this noise. The Klein's more sensitive diodes in the new K-10 clearly lowers the noise floor of the instrument, thus increasing the signal-to-noise ratio, which allows for more accurate and repeatable readings of very dim sources. The K-10 also now passes an important threshold. Although I previously praised the ability of the Klein to measure black on a Pioneer Kuro, additional experience showed that luminance readings produced less than satisfactory repeatability. The upgraded Klein, on the other hand, has no such limitations. It is the first instrument I have used—including the Minolta LS-100—that was able to reliably and consistently measure the black level of a Pioneer Kuro plasma. The Minolta (and the older K-10) would read a value, but it would jump around just enough that one could never be certain about the actual value. Using a small amount of judicious averaging, the improved K-10 returns very steady, reliable numbers from a black test pattern on a Pioneer PDP-5020FD. To see what I mean, consider the following video. As you can see, using ChromaPure's Raw Data module to take ten readings of black test pattern displayed on a Kuro plasma yields luminance readings that vary by only 0.0006 cd/m2. From this, I am confident claiming that the black level of a Kuro PDP-5020FD is 0.001 cd/m2. Using the current measured peak output of 118 cd/m2, that provides a contrast ratio of 118,000:1. In fact, the K-10 is so sensitive that the measured black level increases to repeatable readings of 0.003 when measuring a black pluge, the only difference being a 4% vertical stripe on the left side of the screen. What this means is that not only is the K-10 a professional grade colorimeter, it is also a world-class luminance meter. * The X-Rite Hubble is no longer manufactured.